Compare Ice Cream Makers: Cuisinart or Hamilton Beach? It allows you to control the stuff that goes into your ice cream by giving you the option to choose good quality ingredients. It gives you the possibility to experiment with all kinds of different flavors. It is also a lot of fun! The Cuisinart ICE-30 Pure Indulgence and the Hamilton Beach 68330R ice cream makers are among the most popular with Amazon buyers, but the way each freezes the cream is quite different. The Cuisinart machine uses the pre-chilling of the ice-cream bowl method, while the Hamilton Beach machine uses a freezing mixture made of ice and salt to initiate the process. It is useful to compare ice cream makers before buying one, and you will find below a good description of the Cuisinart ICE-30B Pure Indulgence and Hamilton Beach 68330R ice cream makers together with some tips and recommendations. 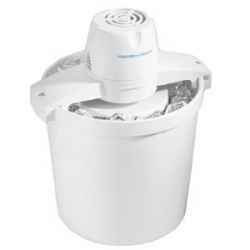 This is a beautifully styled and very simple to operate electric ice cream maker. 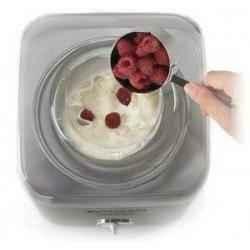 In 25 minutes it can produce up to 2 quarts of ice cream, sorbet or frozen yogurt. It is built of brushed stainless-steel, and it is equipped with a heavy-duty motor, a double-insulated 2-quart capacity freezer bowl, and an automatic mixing paddle. A plastic arm fits into the bowl, and a see-through lid locks with just a simple twist and allows visual monitoring of the mixing process. When you compare ice cream makers, this one stands out as one of the easiest to operate, and the recipe book that comes along gives you preparation options based on either an easy recipe or a more traditional custard style ice cream. Finally, the machine seems to be very sturdy which promises good durability, and is also surprisingly easy to clean as it dissembles and reassembles very easily. This electric ice cream maker is composed of a main outer bucket made of plastic and a 4-quart metal ice-cream container with an easy-lock lid and a stirring paddle. It comes with a user manual and 20 recipes. This ice cream maker's main advantage is that there is no prior freezing of any parts required, but instead you have to provide the salt and ice freezing mixture. To make ice cream, simply add your chilled ingredients into the metal ice cream container, insert the stirring paddle and lock the lid in place. Then insert the container into the main bucket and fill the space between the bucket and the container with ice cubes and rock salt in alternating layers. After you start the machine it takes from 20 to 40 minutes for the smooth ice cream to be ready. Though not as sturdy as the Cuisinart ICE-30B, the quality of construction is still pretty good, and it is not as noisy as some have claimed it to be. The ice cream produced by this machine comes out like soft-serve but hardens perfectly when placed in the freezer for a few hours. When you compare ice cream makers this one also stands out for the ease of clean-up. When you compare the ice cream makers described above, you basically find that both machines make delicious ice cream easily and efficiently, and both are very easy to clean. So, which one to buy? - If you need to prepare large quantities of ice cream, you should get the Hamilton Beach 68330R since it makes up to 4 quarts as opposed to 2 quarts with the Cuisinart ICE-30. - If you don't want to worry about providing the salt and ice mixture each time you want to make ice cream, then choose the Cuisinart ICE-30 which does not require any freezing mixture. Even though with the Cuisinart ICE-30 you will have to chill the freezer bowl for 24 hours prior to each use, if you make it a habit to always keep the bowl in the freezer when not used, you will not have any problems. - When you compare ice cream makers in terms of durability, both machines seem to be well made, but the Cuisinart ICE-30 seems to be sturdier than the Hamilton Beach 68330R. - Finally, if cost is an issue then choose the Hamilton Beach 68330R which costs less. For the Cuisinart ICE-30 only, when not in use, always keep the bowl of your ice cream maker in your freezer. To produce the perfect ice cream, the bowl must have been frozen for at least 24 hours before you use it. By keeping it in the freezer when not in use, it will always be ready when you want to use it. Never leave your ingredients at room temperature before making the ice cream. For good results ALL ice cream and sorbet ingredients must be chilled before they are used. Add ingredients to the ice cream maker slowly through the opening at the top, and don't forget to replace the cover securely. If you need to add some alcohol, add it only towards the end of the freezing process. Because alcohol has a very low freezing point, it can prevent the firming up of the cream if added at the same time as the other ingredients.Same goes for large quantities of vanilla. When running the machine, listen well to sound changes in the motor. As the cream becomes frozen, the motor will tend to slow down. Always turn off your ice cream machine before removing the ice cream. Last but not least, read well the user manual that comes with your machine before using it. 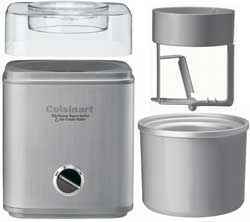 You will find below the two ice cream makers compared here as well as other more upscale machines made by Cuisinart.